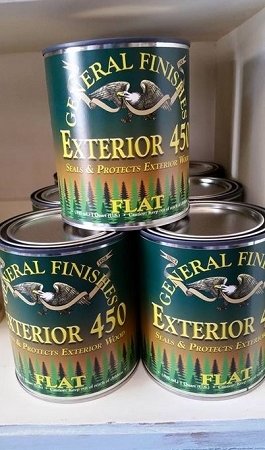 Designed for exterior wood applications, EXTERIOR 450 outdoor varnish provides your wood with a tough, protective finish that will withstand the rigors of the sun, rain, and wind. It is suitable for fences, patio furniture, garage doors, entrance doors, outdoor kitchens and interior windows. It is NOT recommended as a deck finish. Fortified with UV absorbers to help minimize fading and maximize performance, Exterior 450's built-in mildewcide retards mold and mildew growth. Exterior 450 is tough and flexible, and will resist the expansion and contraction of the wood through hot summers and cold winters that typically causes cracking and peeling. It flows well and dries rapidly to a clear finish.